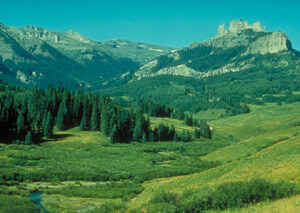 The United States Congress designated the West Elk Wilderness (map) in 1964 and it now has a total of 176,431 acres. All of this wilderness is located in Colorado and is managed by the Forest Service. The West Elk's most attractive offering may be a large and untamed area. You'll find many mountain passes leading to secluded and seldom-seen valleys filled with beaver ponds and lined with trembling aspen that turn a fantastic and indescribable gold in September. Ridges were crumbled and carved by wind and water into fantastic turrets, pinnacles, and crenellated bulwarks. The topography is reflected in many of the area's geographic names: Castle Pass, Castle View, Castle Creek, and the Castles. About two hundred miles of trails offer opportunities for extended loop hikes through the West Elk. The Mill Castle Trail travels up to Storm Pass at 12,460 feet offering extravagant vistas and the best look at the castle like formations of this area. Planning to Visit the West Elk Wilderness? How to follow the seven standard Leave No Trace principles differs in different parts of the country (desert vs. Rocky Mountains). Click on any of the principles listed below to learn more about how they apply in the West Elk Wilderness.